We are back to our Mondays-only schedule. Woman standing and holding a gift-wrapped package: Happy birthday! You're gonna love this gift. Man seated on chair facing away from woman and holding a flat device such as a book or a tablet: How many megapixels? Woman: Hey! There's more to life than megapixels! In the next panel the man has turned around and is looking up at the woman. Man: Of course! 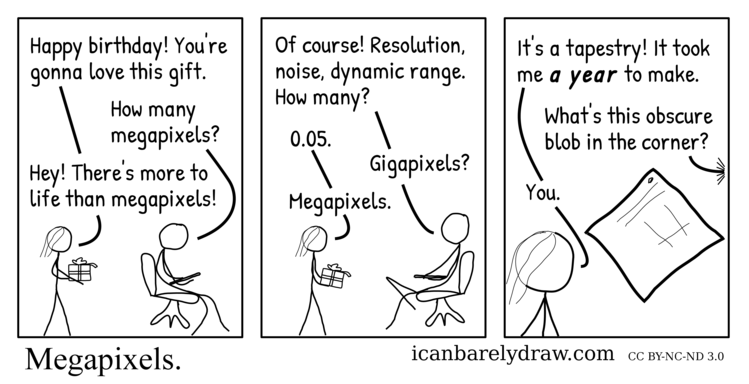 Resolution, noise, dynamic range. How many? In the next and final panel, a diamond-shaped object is seen vertically positioned in the backgorund. The woman's head is seen in the foreground. Woman: It's a tapestry! It took me a year to make. Off-panel voice: What's this obscure blob in the corner?